This was apparently filed by ‘Consumer Reviews Australia’, a blog (now shut) that routinely publishes reports on scams and frauds. It was a popular blog, and highly credible. So when we saw a DMCA notice with their name on it, it triggered an alert. 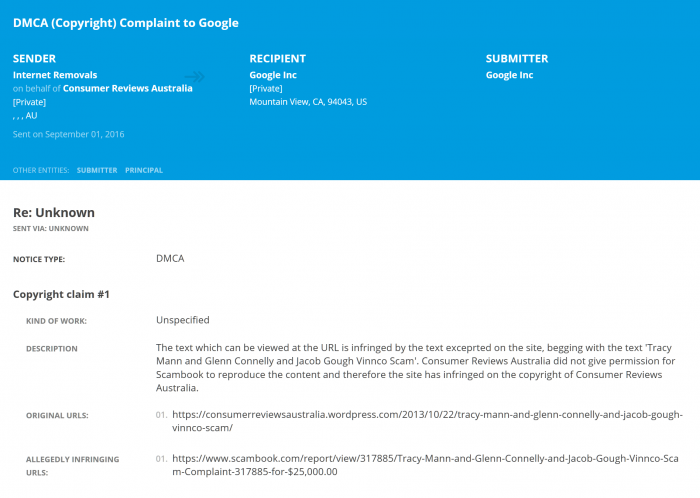 This was was also the ONLY time any DMCA was filed by ‘Consumer Reviews Australia’, ever. And to no one’s surprise, they confirmed to us that they had no idea about this DMCA. Of course it’s highly unlikely that Bartercard Pty Ltd hired someone to file a DMCA on their behalf, against a link that has nothing to do with them. Is it true that Glenn Connelly is being charged with charity fraud and this fraud occurred when he was a Managing Partner in Vinnco with Jacob Gough. Has Jacob Gough, Tracy Mann and Andrew hawkes been charged yet and if not why not. Anyone who starts a company or works for a company knowing on of the partners is a convicted criminal and fraudster is fully responsible for ANY crimes committed against the money their clients have paid. You have been scammed by Vinnco with its criminal partner Glenn Connelly and his partner Jacob Gough the con man. Slimy Andrew (sell my soul) Hawkes would say anything for a quick buck and knowingly sold the Vinnco brand even though it was contaminated by criminals and con men. This guy is a total sleaze and needs to be held fully to account. Tracy Mann is the other con artist involved and also knowingly let people put money into a scheme that was run by a criminal and fraudster. Now they are merging with BBOM and known and named pyramid scam out of Brazil. InterBBOM – stands for more money for Jacob, Glenn, Andrew and Tracy and none for the people that have put all the money into Vinnco. This is a disgrace and more people need to be made accountable. This complaint and/or review was posted on Webactivism.com on 13 July, 2018 and is a permanent record located here: https://www.webactivism.com/glenn-connelly-investigation-for-fraud-impersonation-and-perjury-fake-copyright-takedown-scam. The posting time indicated is Central Standard Time. Furthermore, Webactivism.com has an exclusive license to Glenn Connelly investigation. It may not be copied without the written permission of Webactivism.com. This investigation on Glenn Connelly is submitted and written by one of our member. Any and all opinions and information are published as is. We does not edit or remove any aspect of the report and is merely a free-speech platform. As such, we cannot be held liable for the investigation reports and articles posted about Glenn Connelly.